Coolrooms are used to store a massive number of food items, which requires the low room temperature. Hence, it’s crucial to upkeep the coolroom for its smooth operation in the long run. So, it is better to find a professional for commercial refrigeration repairs to keep your coolroom well-functioning in the long run. 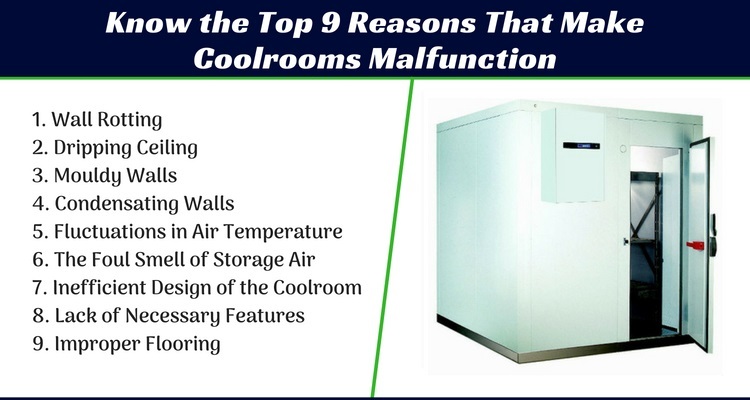 Read this content, to know some coolroom problems and their solutions. Wall Rotting: If the coolroom has no vapour barrier or it is wrongly installed, it can cause wall rotting. Hence, the way a rotten wall can annoy you is moisture sipping into the wood cladding. Ask professionals to resolve this problem; they make use of different insulation or re-insulation materials. However, a vapour barrier is not always dependable. Instead, try a method that can sip back the moisture would be the best solution possible. Dripping Ceiling: Improper installation of vapour barrier also causes the dripping ceiling. However, inadequate ventilation or poor attic solution is another reason for dripping ceiling problem. Well, as a solution, apply proper insulation and direct the pressure direction of the vapour barrier accordingly. Mouldy Walls: Varying surface temperature along with unstable moisture level pampers the mould growth. Even if the growing moulds are a common problem, you can prevent this by keeping the coolroom dry, disinfected and clean. However, mould redevelops from time to time, so it is better to have proper insulation to avoid condensation. Condensating Walls: The problem of condensation wall takes place when the internal surfaces are colder than the air hitting it. You can solve this problem by ensuring proper airflow inside or insulation of the wall surfaces. Fluctuations in Air Temperature: The changes in air temperature cause when you store a lot of items that need more cooling, or it could be inadequately located thermostat that has poor sensing power of room’s cooling requirement. Even, evaporator coil with huge temperature difference also causes uneven airflow. The Foul Smell of Storage Air: Sweating products generally emits ethylene and carbon dioxide. These gases in excessive quantity can cause your coolroom smell terrible. Another reason that you can look after is the presence of perishable products. If you find any product is rotting, then dispose it right away. Inefficient Design of the Coolroom: It is important to consider the design of the cool room with regards to the compartmentalisation. With the increased compartment, you can reduce the fridge load. Even, experts recommend not mixing different kinds of foods, such as meat and vegetable at the same place. Well, the reason is different kinds of food require different temperature for storage. Lack of Necessary Features: Without the essential elements, it is impossible for cool rooms to provide optimal temperature management. Features, such as automatic defrosting ensure maintenance free performance. Moreover, an adjustable thermostat is necessary, as you can set the most optimum temperature based on weather conditions and save the energy in turn. Improper Flooring: A medium or large size freezer room needs the floor to be insulated or to maintain the required temperature. On the other hand, the floor insulation increases the energy efficiency. However, insulated floors change in levels, which is sometimes not easy to access. To avoid this problem from occurring, recess the floor or the door can be made shorter. While wrapping up here, you should know health and safety is essential and the coolroom supplier should provide the guarantee that the facility is safe to operate. Seek for the professional help for coolroom services to spare voiding the warranty and ensure a safe working environment for the worker.